Good morning my sweet blogging friends. 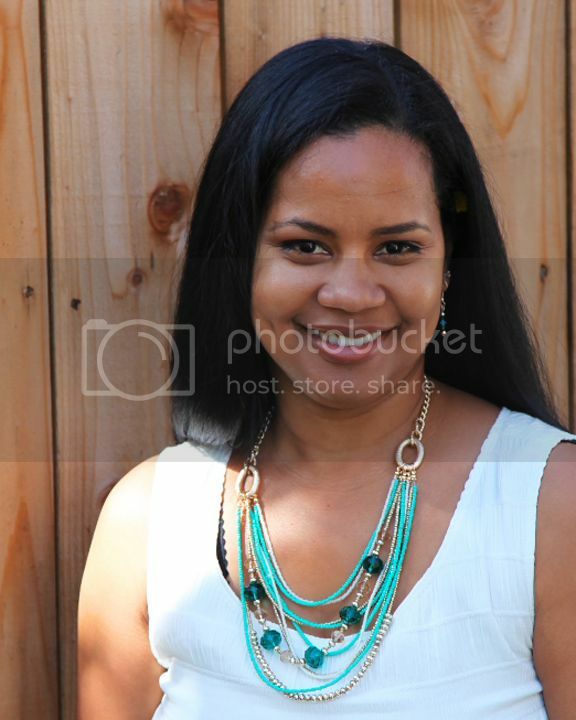 Oh, how I have been enjoying this warm weather we are having here in CA. Well today at SweetStamps, we have a new challenge for you and I know you will love it. I LOVE this card!! I really, really do. This was my first time making a criss cross card and I don't know why I never thought of doing one before. It really adds a lot of fanciness to a card. The final card itself measures 6x6. The cardstock I used is from Bazzill Basics and the patterned paper is from Prima: Zephyr. This is the inside of the card, once you remove it from the envelope card. So I hope to see you this week at SweetStamps. Wow this card is gorgeous Calypso. Your colouring is fabulous. A really lovely creation and perfect for our 'Flower Power' theme. It's great to see you at Allsorts challenge this week, thanks so much for joining in. The colors are fabulous- love the card design- love the coloring on the image, love the tab idea too....just Beautiful!!! Beautiful card. Love all the elements and the shape! Great color choices. Beautiful card, love the design. Thank you for joining us at SCH this week. Amazing DP's and rich colours! I've never tried one of these cards but they always look amazing! Love, Love the paper you used..it is so very pretty..and your layers are awesome! Thank you for sharing your talent at Card Crafter's Circle! 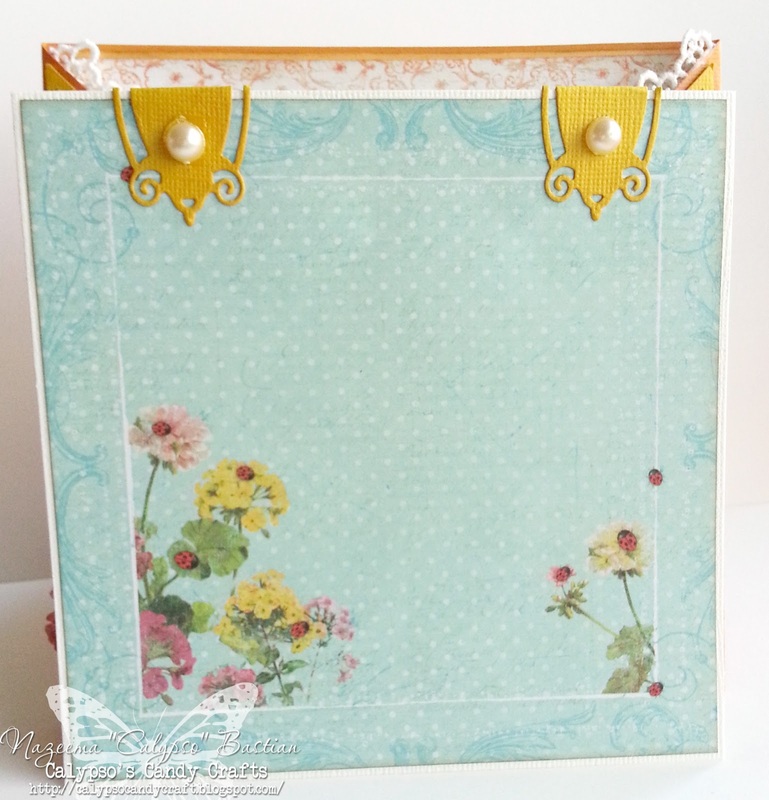 Gorgeous....love Prima papers and your image is stunning. Love your colors on her and your coloring. It has been ages since I made a criss cross card, thanks for inspiring me to try another one soon. This card is Absolutlely Stunning Caylspo!! 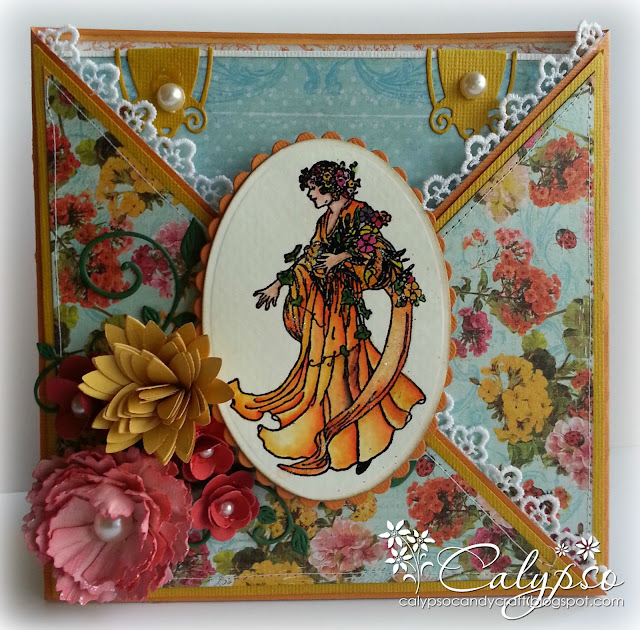 Beautiful coloring with your stamp image and these Prima papers are gorgeous! WOW what an awesome design both inside and out. Love the vibrant colors you chose for the papers, Flower Lady image and flowers. It's a gorgeous card.